Even before it broke box office records with its $132 million opening weekend, 20th Century Fox had green lit a sequel for Deadpool. And those who have seen the end-credit sequence for the R rated superhero adventure now that Cable is going to be introduced in Deadpool 2. 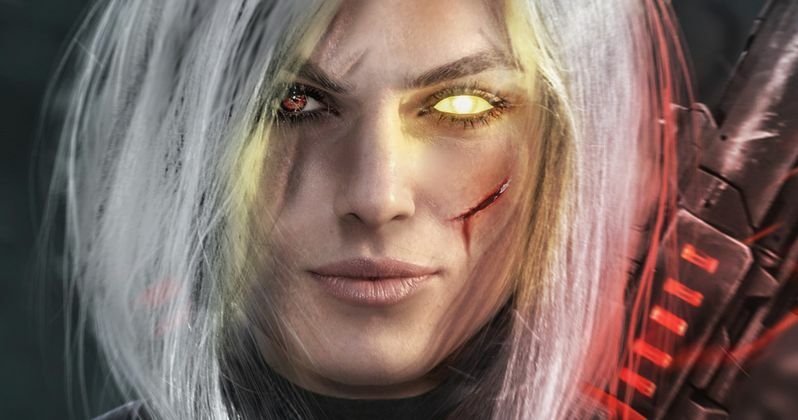 Now, fan art maestro BossLogic has imagined what two very different actors might look like as this fan-favorite Mutant. If you haven't seen Deadpool yet, you may be scratching your head, wondering why there is fan art depicting Pirates of The Caribbean star Keira Knightley as the older, tougher, rough, decidedly male character Cable. No, it has not been confirmed that the Deadpool team is pulling a fast one, gender-swapping yet another iconic Marvel comic book character. In the Ferris Bueller's Day Off-inspired end credit sequence, Ryan Reynolds arrives to promise that Cable will show up in Deadpool 2. But he's yet to be cast. That doesn't stop the Merc with the Mouth from throwing out some great suggestions. He first mentions Mel Gibson and Dolph Lundgren as possible candidates. But then he brings down the house with his third suggestion, Ms. Keira Knightley. As you can see in the art below, perhaps this isn't such a terrible idea. Though the second option seems a little more viable. Over the weekend, Avatar villain Stephen Lang took to his Twitter to campaign for the iconic role of Cable in the sequel. In the comics, Cable is the leader of X-Force, who was born with telepathic and telekinetic abilities. Like Mel Gibson and Dolph Lundgren, the 58-year-old Stephen Lang would be within the proper age range to play Cable, and it's worth noting that campaigning for a role through social media has paid off in the past. After mentioning in interviews and on his social media pages several times that he wanted to play Gambit, Channing Tatum eventually did lock down the role in this X-Men spinoff, which starts production this spring. Ryan Reynolds will most certainly return as the Merc With the Mouth for the sequel, but it isn't known if any of the supporting cast will be back in Deadpool 2. The cast of the original also includes Morena Baccarin, Gina Carano, Ed Skrein, T.J. Miller, Brianna Hildebrand, Olesia Shewchuk, Style Dayne, Rachel Sheen and Dan Zachary. With Cable showing up in the sequel, this could help set up the X-Force movie that 20th Century Fox has been developing. While Deadpool 2 is moving forward fast, it isn't known when production may begin, or when 20th Century Fox may release this sequel. The studio will release X-Men: Apocalypse this May, with Wolverine 3 arriving March 3, 2017. The studio is also developing The New Mutants and X-Men 7 as well, but it hasn't been confirmed when those projects will begin production. Take a look at the fan art below. Who do you think makes the better Cable? Remember, this guy might be leading his own franchise well into the future!